One of the band's signature qualities is combining often dark and gloomy lyrics with upbeat melodies and hooks. With song titles like It's Easy to Sleep When You're Dead and I Felt Like Smashing my Head Through a Clear Glass Window, it's not too difficult to deduce that perhaps their greatest inspiration comes from their darkest times -- or perhaps they just have a really good sense of humor. 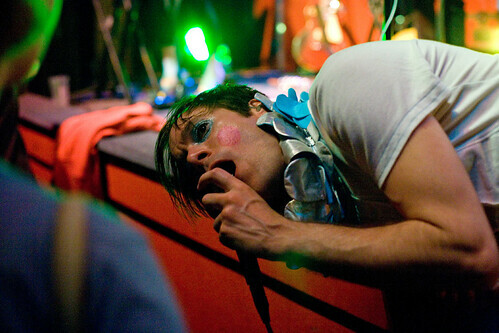 This week's spotlight music video is ID Engager by Of Montreal. Straight out of Athens, Georgia (no, not Montreal), Of Montreal dropped on the scene over a decade ago with their debut album Cherry Peel. Fronted by the eclectic Kevin Barnes, Of Montreal's sound has been described as a transformation from lo-fi, psychedelic indie-rock to a fuller multi-layered sound with funk, reggae and afro-beat influences.